I’ve always been a fan of kongs and toy puzzles and nose work, but I never truly realized how they fit into the bigger picture of enrichment. Enrichment is so essential to a dog’s happiness and mental well being because it allows them outlets to use their doggy senses. I learned that it doesn’t only encompass the taste and smell senses in the form of food games, but also visual, hearing, and touching exercises. Enrichment can be fun, easy, and cheap – and for what a dog gets out of it, the extra effort is one hundred percent worth it. In shelters, dogs are often so bored, overwhelmed, and stressed that they can quickly start displaying negative behaviors that are unfortunately sometimes a poor representation to the dog’s true personality. Enrichment activities help to postpone or prevent the onset of these behaviors by stimulating the dog’s senses and wearing them out mentally. 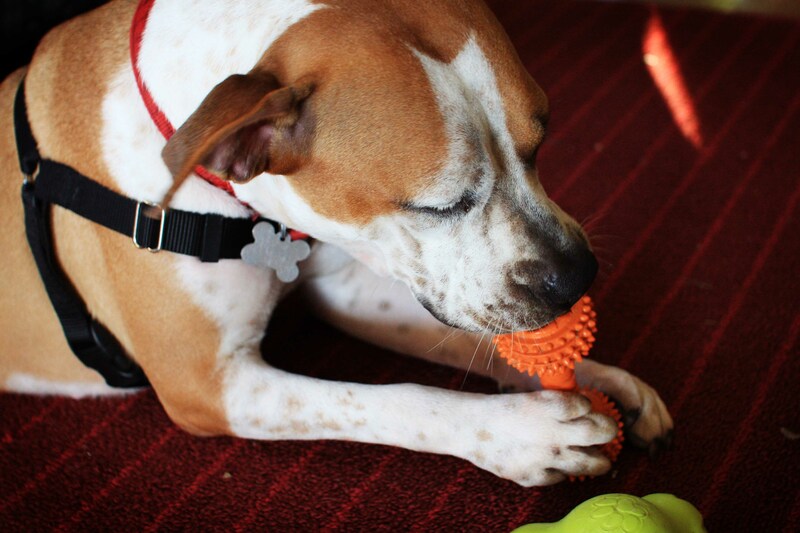 The dogs then in turn show better to adopters because they are either preoccupied working on their puzzles and therefore not barking, or they’re just so tired from all their work to get the treats or whatever that they’re mellow in their kennels. At Animal Farm we learned about all kinds of different enrichment activities. The most well known ones are the kinds involving food that are supposed to be tricky and keep the dog busy for a while, including frozen stuffed kongs, busy buckets, and ice treats. Frozen stuffed kongs are self explanatory, but remember that you can stuff them with all sorts of different foods and treats (just make sure you’re not feeding your dog three meals in the process). Busy buckets are small pails that you fill with different things to do, smell, and taste. The point is to stuff them very tightly so that it’s a challenge for the dog to get each fun object out – try to flip your busy bucket upside down without anything falling out! Ice treats are also pretty self explanatory. Fill a bucket with different bones, balls, treat toys, etc. then add a little bit of kibble – fill with water, freeze, and you’re done. 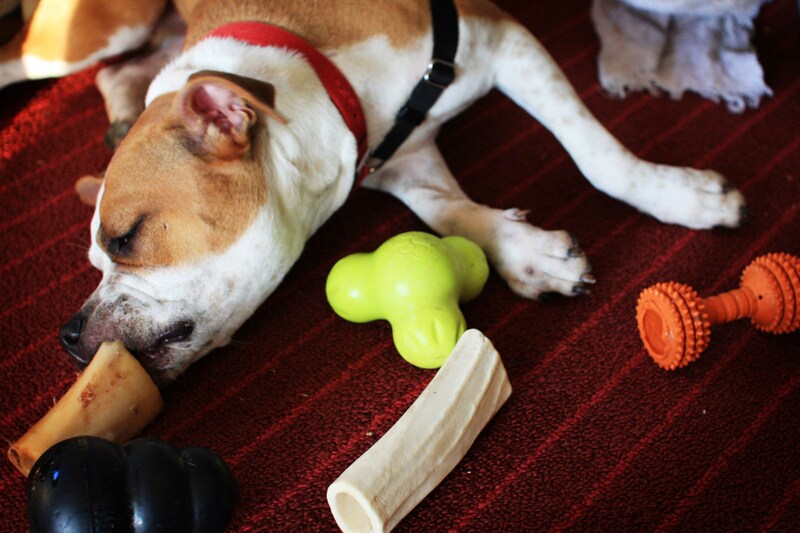 All of these toys can include your dog’s normal meal contents to make dinner a fun and difficult exercise! Busy buckets were a total blessing with our energetic housemate Birdie; they would keep her quiet and still for more than thirty seconds! Smell is also, as expected, a very good way to engage dogs. In shelters, simple PVC pipes with holes drilled in them can be a world of smells for a dog. Fill it with something smelly, like dirty hamster shavings (gross for humans but jackpot for dogs), and close the endings to create an interesting activity for the dogs. You can hang them around their kennel or you can put them in the exercise yard where the dogs are walked to give them something to investigate while they get their potty break. Even short, simple activities like this can make a big difference in a dog’s mental well being. 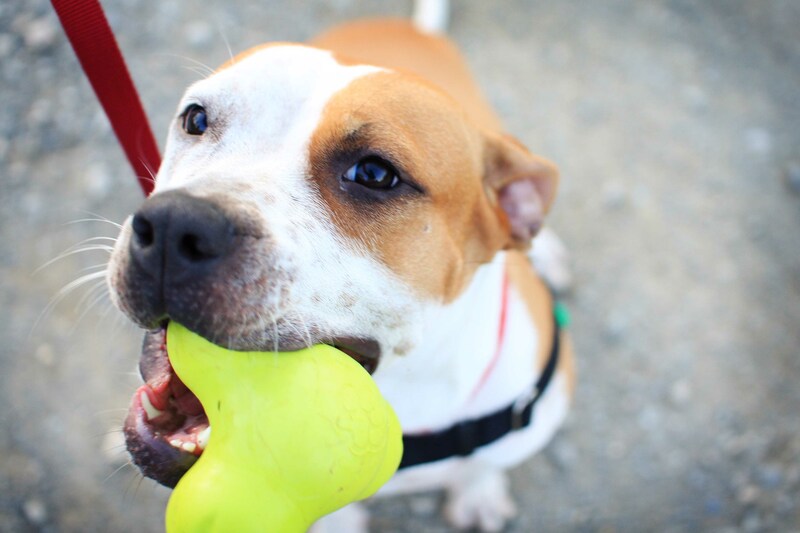 I could write forever about other ways to help make a dog’s living environment – home or shelter – more positively stimulating, but all of this and more is on AFF’s website. There you can find a plethora of information about enrichment, including step-by-step instructions and explanations about the benefits. Remember that these are not just beneficial for shelter dogs, but for your own pets as well! 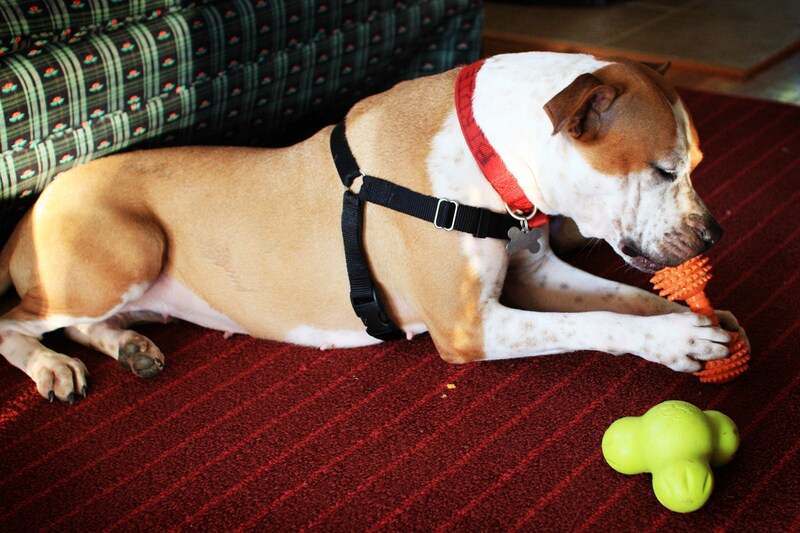 All dogs can use an excuse to work their sniffer, tongue or noggin. A tired dog, whether mentally or physically, is a happier dog! This entry was posted in Dog talk, Photography, Rescue/Humane Society and tagged Animal Farm Foundation, combatting boredom, enrichment, exercise, food puzzles, helping dogs, shelter dogs, training. Bookmark the permalink. Love these ideas! They would be great for my rambunctious foster dog! A tired dog is a happy dog – so true! Our ten-month old pitbull has a ton of energy. One of the ways we help him to burn off that energy is by only feeding him his meals through a toy, specifically the kong wobbler. We also only feed him in his crate, which helped him get over his separation anxiety and dislike of being in small enclosed areas. It works wonders on chilling him out because it takes him 20 minutes to eat versus two minutes. Great post, as usual! I’m going to have to try the pvc pipe thing too. The last line of your post “A tired dog, whether mentally or physically, is a happier dog!” has been my motto ever since we got Nola! I feel like people would have so many less ‘behavioral’ problems with their dogs (too much energy, chewing, being mischievous) if they would just stimulate their minds and/or bodies more! Thanks for the post! I like to place pieces of my dog’s kibble all around the house for her to sniff out. She goes up and down the stairs and is ready for a good nap afterwards. The best part is several hours later when her nose picks up the scent of a piece of kibble she over-sniffed. Then the hunt starts again. Just be prepared to clean drool off your furniture.